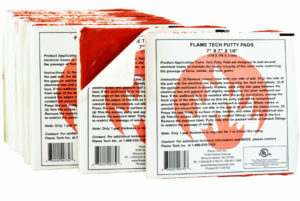 UNIQUE Firestop Putty Pads are 7” x 7” x 1/8” intumescent firestopping pads. They are made to seal around electrical boxes in fire-rated walls. UL rated. UNIQUE Firestop Putty Pads are convenient and easy-to-use intumescent firestopping pads designed to seal around electrical boxes in firewall systems. These life-saving putty pads will restore and maintain the hourly rating of your firewall and restrict fire, smoke, and other toxic gases from breaching the firewall in a fire emergency. They’re easy to install and contain no asbestos fillers. UL Classified for 1 & 2 hour gypsum fire-rated wall systems. For friendly and expert help with installation or any other questions, call our Customer Service line at 251-960-5018. Order today by 10 am for delivery tomorrow.